LDT's High Speed Interface for S88 feedback modules. Mostly the HSI-88 is used as a second interface for sensor reading only. Therefore it is necessary to set the iid attribute to link sensors in the plan xml file which is described in chapter Multiple Controllers. The HSI-88 comes with a 9 pin serial cable, and is as far as I know wired "1 to 1". If your computer does not feature a serial device you can use an USB to Serial adapter which ist mostly mapped as "/dev/ttyUSB0" under Linux and as "COM3" or "COM4" under Windows. Number of 16-Port modules connected on each chain. The first address of the first module of each chain immediately follows the last address of the last defined module of the previous string. This also applies if fewer modules are actually connected than are defined. 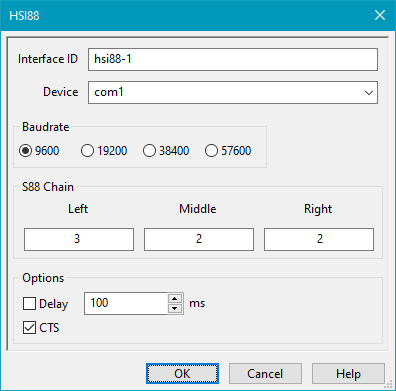 modules connected to "Bus 1" (middle connector on tams) have to be configured as "s88 chain left"
modules connected to "Bus 2" have to be configured as "s88 chain middle"
modules connected to "Bus 3" have to be configured as "s88 chain right"
If activated the sensor reports low first after the delay timing to avoid unwanted events cause by bad contact of wheels. The delay timer will be set again to this value if it was high within this timing. The max. is 2000ms which is also advised and used in other sensor reporting devices. Option for DIY compatible devices to disable hardware handshake.